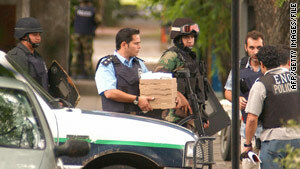 A policeman carries pizza that robbers ordered during the January 2006 bank heist in Acassuso, Argentina. (CNN) -- About 600 witnesses are expected to testify in a trial that started Monday for a bank heist some call Argentina's "robbery of the century." Four suspects are on trial in connection with the January 13, 2006, robbery of the Banco Rio in Acassuso, where robbers took hostages, stole $8 million in valuables and cash and escaped in a boat despite being surrounded by 200 police, said Telam, the government's official news agency. During the robbery, Telam said, robbers ordered pizza and soft drinks for the hostages, sang happy birthday to a female lawyer and left behind toy guns. The robbers also left a whimsical note saying they stole just "money, not love," Telam said. The trial is expected to last three months, the news agency said. The government's Judicial Information Center said the four suspects are Ruben de la Torre, 56, Sebastian Garcia Bolster, 40, Julian Zalloecheverria, 51, and Fernando Araujo, 41. Witnesses will include bank officials and employees, hostages, police, crime technicians and experts, the Judicial Information Center said. The suspects have pleaded innocent to charges of aggravated robbery with firearms, which carries a sentence of three to 10 years in prison, Telam said. A judge found insufficient evidence for a fifth suspect, Mario Luis Vitette Sellanes, who is being tried in connection with a lesser robbery, Telam said. Robbers took jewelry and precious stones and metals from safety deposit boxes and then forced the bank's manager and head teller to open the main vault, and stole Argentine pesos and U.S. dollars, officials said. By the time authorities broke into the building, the robbers had vanished. A piece of furniture covered a tunnel opening that the two robbers inside the bank had used to get to an underground sewage system, where an accomplice waited for them in a boat, Telam said. The robbers paddled to a nearby truck, where another accomplice was waiting, officials said. The wife of one of the suspects told police her husband had talked about the robbery, which he allegedly planned with men he met in prison, Telam said. Judges are expected to see more than 200 pieces of evidence, including bank blueprints, photographs, closed-circuit videotapes and taped telephone conversations. Acassuso is a suburb of Buenos Aires, the nation's capital.